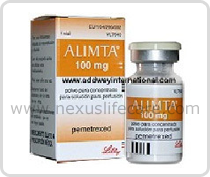 Uses:- Alimta Injection may be used for the treatment of non-small cell lung cancer (NSLC). Alimta Injection is used with cisplatin for the treatment of malignant pleural mesothelioma (a type of cancer that affects the inside lining of the chest cavity) which cannot be treated with surgery. Side Effects:- Skin rash, numbness or tingling, depressed mood; nausea, vomiting, diarrhea, constipation, indigestion, loss of appetite; or muscle pain.